Image © 2013 Estate of Ad Reinhardt/Artists Rights Society (ARS), New York; courtesy David Zwirner, New York/London. Years ago I attended a figure skating extravaganza – Disney on Ice, or Barnum Brothers on Ice, I can’t remember. However I remember being struck by the performance of the clown who fell all over the place, never hurting himself and always terrifying the audience while making them laugh hysterically. His graceful mash ups were a result of timing and incredible skill. Therein lies the secret of great comedy – a deep understanding of material coupled with a staccato presentation that simultaneously builds anxiety and relief in the audience. Simply put, one cannot do comedy well without full and holistic knowledge of a topic or skill. This is serious stuff, despite the entertainment we assume when we hear comedy/cartoon/comic. I just finished an exhibition catalog of Ad Reinhardt cartoons that was released in December by David Zwirner in conjunction with an exhibition of his famous, austere “Black Paintings”. In this exhibition curated by Robert Storr his incredibly refined paintings – as abstract and serious as you can get – were prefaced by a room full of cartoons both collected and made by Ad Reinhardt. The catalog is a collection of his cartoons done for PM magazine about modern art called “How to Look”. The cartoons were meant for a general audience, though the layers of meaning in each cartoon speak volumes to specialized and general audiences. And while the cartoons were made and published originally in 1946, the message and meanings in the work are just as relevant today. Ad Reinhardt had some serious views about what it means to be an artist in society, what it means to have an art practice, and what it means to be a genuine artist. Trust me – if you read his Art as Art, you may be stymied (as I was) for months in the studio, realizing your expectations of being an artist was carefully squashed and reconsidered after reading Reindardt’s principles. He’s a force to be reckoned with, and is both terribly serious and terribly funny. A side note about Reinhardt’s work as an illustrator comic – in the late nineteen-thirties and forties he was a prolific cartoonist for a diverse array of clients, including the Brooklyn Dodgers, Glamour, Macy’s, the National Council of American-Soviet Friendship, the New Masses, the Saturday Evening Post, and Ice Cream World, the publication of the ice-cream trade, for which he was the art director. While at PM when he made these cartoons one of his colleagues was Theodor Geisel, otherwise known as Dr. Seuss. 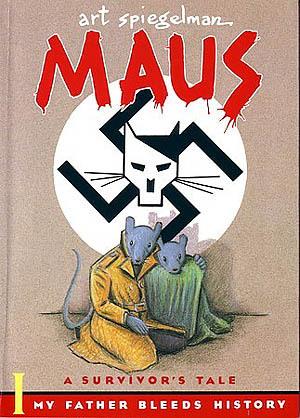 Another serious subject to be broached by the cartoon is the work by comic artist Art Spiegelman titled “MAUS”. This cartoon is a story about Nazi Germany told through the eyes of mice. The artist’s parents were Holocaust survivors, and the cartoon was born out of hours of discussion with his father. Why a comic and why mice? The mouse creates a distance from his father’s story, and the cartoon is the visual medium that accidentally makes the most powerful impact. When people approach a cartoon their guard is down, and they are ready to be entertained. If you understand this as the creator, then you realize you have a Trojan Horse at play: you can present incredible material to an unsuspecting audience. The “Maus” work was so powerful that in 1991 when the cartoon was released the Museum of Modern Art staged a special exhibition to honor Maus and the art of Art Spiegelman. Coincidentally Robert Storr organized this exhibit too while acting as MOMA’s Curator of Paintings and Sculpture. Museums are increasingly hip on presenting the work of comic art as fine art – over the years I’ve seen Roger Crumb’s work land in the Yerba Buena Center for the Arts in San Francisco and the Modern Art Museum in Paris. Art Spiegelman’s work including his Garbage Pail Kids have toured the museums including the Vancouver Art Museum in BC. I recently saw Maira Kalman‘s work at the Jewish Museum in San Francisco, as well as in booths at the Art Basel show. While I wouldn’t call her art cartoons, humor and illustration are the bedrock of her work. Saul Steinberg is the consummate artist as cartoonist, and Philip Guston has been characterized as having a “comic realism” stage. Opening today at the British Library is the exhibition, “Comics Unmasked: Art And Anarchy In The UK“. The art of comedy has slipped into the corporate realm as well, where executives have sessions facilitated by comedians in order to create camaraderie and I imagine, productivity and innovation. Executives are being asked to explore improv classes to keep them light on their feet and sharp in their minds. Today I had a colleagues ask if I wanted to participate in an improv exercise. I jumped at the chance – I’m always game for any opportunity to seriously open new paths of thinking, break the molds of presentation and bring humility to life. Comedy is defiance. It’s a snort of contempt in the face of fear and anxiety. And it’s the laughter that allows hope to creep back on the inhale. The Four Sacred Art Texts are Confusionist, Doughist, Tantrumist, and Sham-Buddieist. The Four Art Castes are Purehatpriests, Guruteacherhats, Sunnyascetichats and Bighatdevotees…” – from Ad Reinhardt’s cartoon “Portend of the artist as a Yhung Mandala”, pictured above.